The 2016 Perseid meteor shower, peaking this month, promises to be a spectacular show. 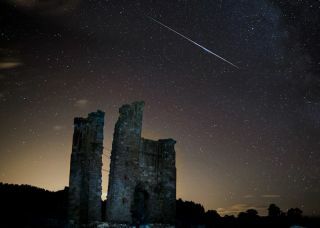 Stargazer Thomas Heaton sent Space.com this photo of a Perseid meteor soaring over Edlingham Castle in Northumberland, England, on Aug. 12, 2013. The Perseids are here: The dazzling meteor shower's peak of activity is Aug. 12, but you can already see its streaks of light peppering the sky. Skywatchers are particularly excited about this year's Perseids. Though the meteor shower is an annual event, the Perseids are in outburst this year. That means that rather than 80 meteors per hour, we might see 150 to 200 per hour, according to NASA meteor expert Bill Cooke. The Perseid meteor shower occurs when Earth moves through the trail of dust and debris left by Comet Swift-Tuttle as it orbits the sun; the debris hits Earth's atmosphere and burns up, creating the white-hot streaks we see in the sky. Most of the pieces of debris, which move at 37 miles per second (59 kilometers per second), are about the size of a grain of sand, NASA has said. The 2016 Perseid meteor shower will appear to radiate out from the constellation Perseus as shown in this sky map from the National Astronomical Observatory of Japan. The Perseids will peak on Aug. 12, 2016. Earth is passing through a particularly dense clump of debris this year — the source of the outburst — caused by the influence of Jupiter's gravity on Swift-Tuttle's trail. The number of meteors is increasing as Earth penetrates the heart of the debris, and it will diminish again once it passes through (after the peak). The moon will be full six days after the meteor shower's peak, which might wash out the vivid streaks across the sky. So it might be a good idea to look earlier on, before the peak, to see the brightest streaks and fireballs, and to go to the darkest location you can, Cooke said. All of the meteors will appear to stream away from the constellation Perseus — that apparent source is called the shower's radiant — but will materialize all across the sky. "If anybody's going to get out and see a meteor shower, it probably should be the Perseids this year," Cooke said. "It is the one I would flag and say you've got to go out to." Editor's note: If you have an amazing photo of this year's Perseid meteor shower you'd like to share for a possible story or image gallery, please contact managing editor Tariq Malik at spacephotos@space.com.